WE ARE THE ANDREW COUNTY KINGS!!! 2011 - 2012 Seniors Good Luck ! 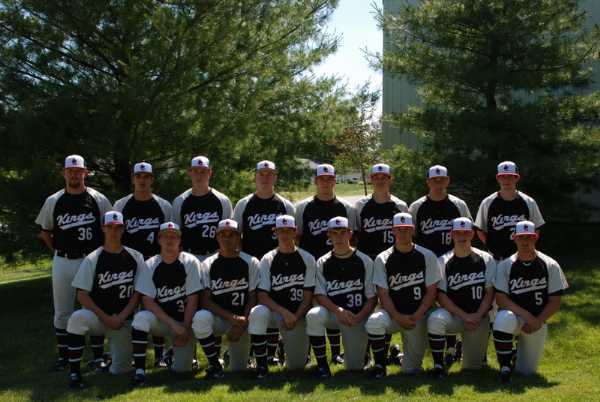 Good luck to the 2011 nd 2012 Andrew County Kings 18U Seniors! 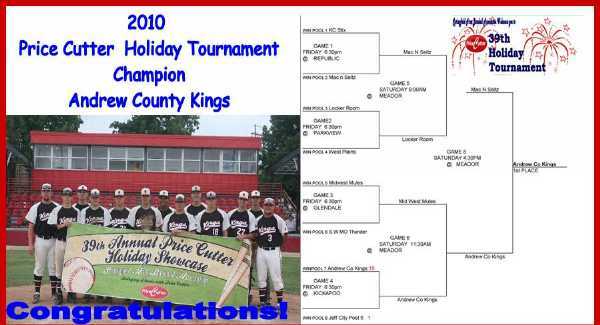 Good luck to the 2010 Andrew County Kings 18U Seniors! 2010 Springfield Area Baseball Association (SABA) Champs! The Kings won their first SABA tournament on July 3rd in Spingfield after five 2nd place finishes the last 10-12 years, including last year. This is also the 3rd Kings tournament win this year. They defeated Mac-N-Sietz in the championship game of this 32 team tournament by a score of 7-5. They went 6-0 in the tournament outscoring their opponents 71-14. The bats were hot!! The Kings blasted 16 home runs, 2 triples, and 11 doubles. 29 of their 68 hits were for extra bases. The all tournament team was loaded with Kings as well as MVP's and other awards. Andrew Nellestein ('09 Mr. Hustle) and Keaton Steele (SS), were repeats on the All Tournament team. AC Kings Golf Tournament - June 19th !!!! The AC Kings Annual Golf tournament fund raiser was be held Saturday June 19th at Duncan Hills in Savannah, MO. The tournament ran into a severe storm with about five holes to play. Everyone made it safely to the clubhouse. We were able to eat and award prizes. A Flight: 1) Scott Nelson, Ron Hook, Matt Nelson, and player. B Flight: 1) Brett Smith, Andrew Nellestein, Mike Lierz and Ross Rocha. Thanks to all who sponsored holes, played and helped plan and organize!!! "Are you crying? Are you crying? Are you crying? There's no crying, there's no crying in baseball! Rogers Hornsby was my manager, and he called me a talking pile of pigs SH--! And that was when my parents drove all the way down from Michigan to see me play the game! And did I cry? NO! NO! And do you know why?" "BECAUSE THERE IS NO CRYING IN BASEBALL!" ---Jimmy Dugan (Tom Hanks) in "A League of Their Own"
"You gotta have two things to win. You gotta have brains and you gotta have balls. And you got too much of one and not enough of the other." ---"Fast" Eddie Felson (Paul Newman) in "Color of Money"
"I don't want to play golf. When I hit a ball, I want someone else to go chase it." "Baseball is 90% mental, the other half is physical." See anything you like or do not like. Let The Stat Man know. Don't forget to sign the Guest Book.